Published by Joshua Clare-Flagg on 2 Dec, 2014. I’ve been desperate to get my hands on a Gruppo Gamma for well over a year now. But every time I try, they’re out of stock. It’s no joke to say that every time they restock, the whole lot flies straight out of the door. This goes to show how popular the Singapore based brand have become in their pretty short life span. 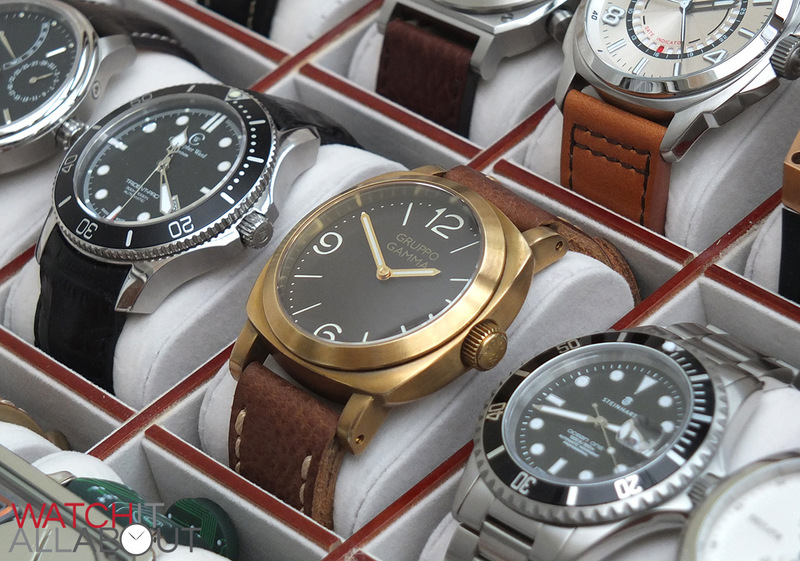 Specialising in well made affordable Panerai-esque watches, there’s little wonder everybody wants one. 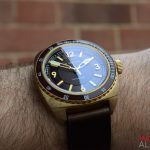 All their watches are prices around $300 (including the watch we’re reviewing now), and are well regarded as being excellently made for the price. 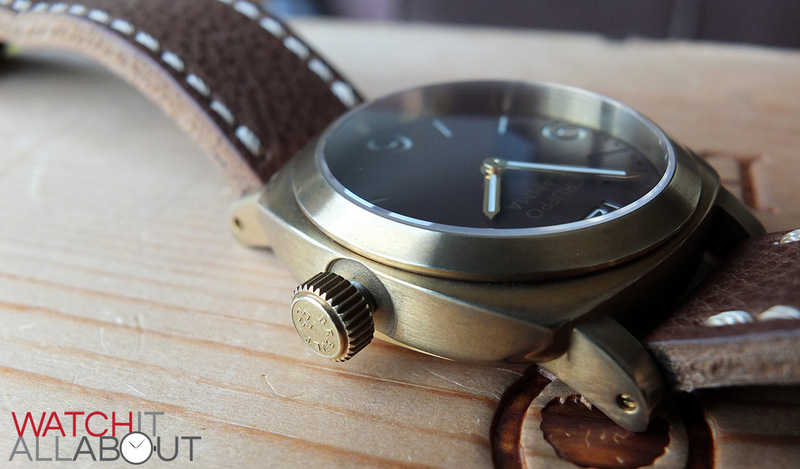 It may be worth noting that this is my first brass watch in for review, so I’m pretty excited. 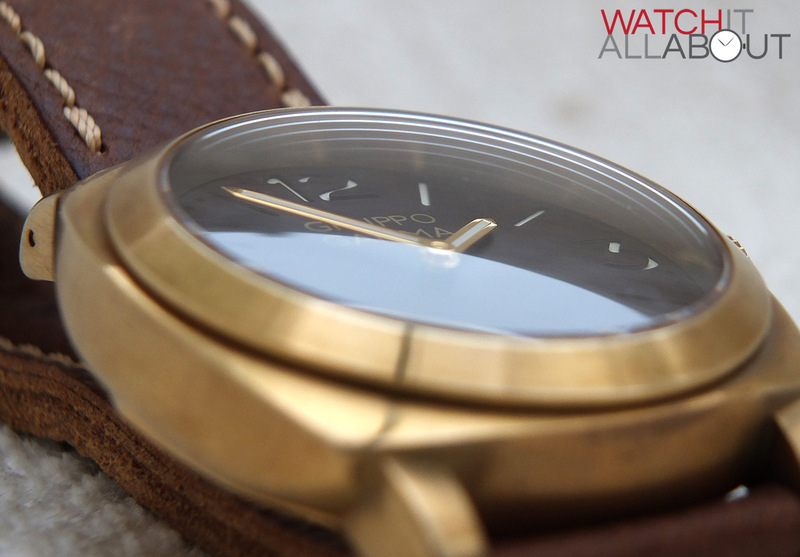 Let’s take a closer look at the Gruppo Gamma A-41 to see if it’s a good watch for the money. The case is quite obviously brass, and is a very pleasant shape. Rather than having a squared corners of all sides of the case, the main feature to me are the how the bottom corners behind the lugs are pleasantly curved inwards, creating a pleasant ergonomic design. 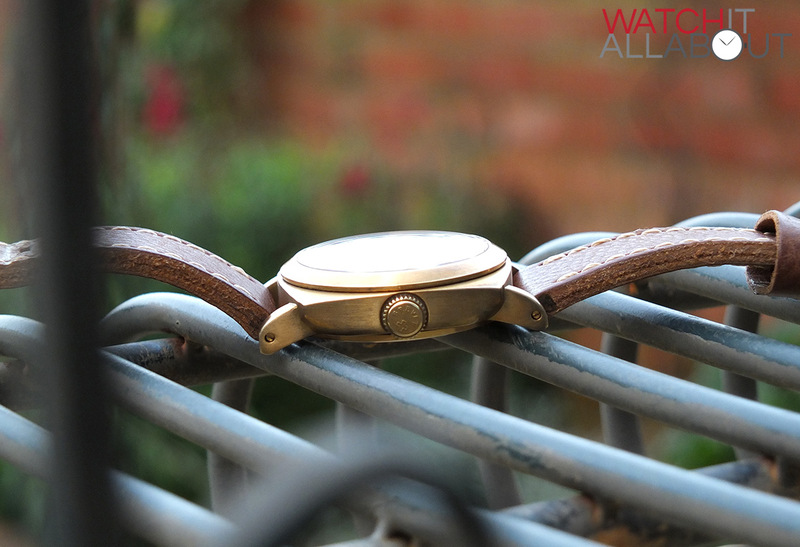 It’s a decent size – measuring in at 44mm in diameter, with a height of 16mm, and a lug to lug length of 54mm. To me, this is about the largest I’d comfortably go, but I can see it being a little too large for some. 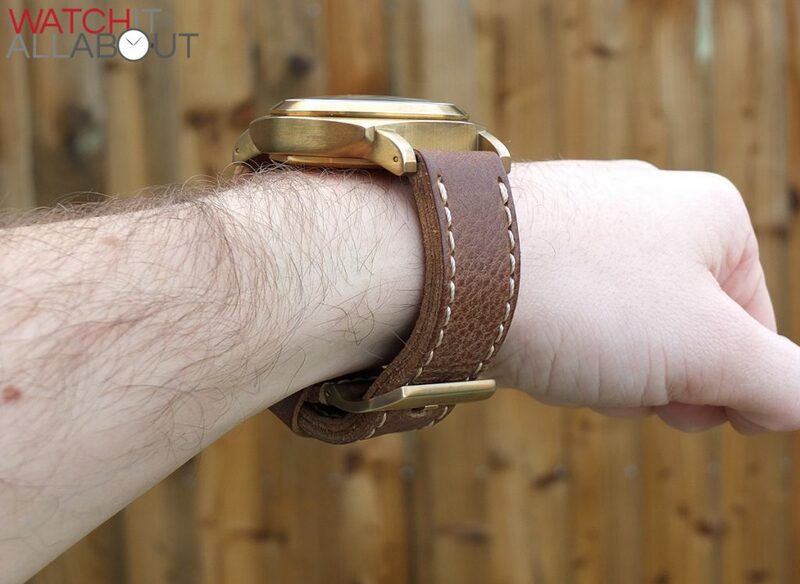 The height, when coupled with the thick strap, make the watch a little difficult to fit under a cuff. 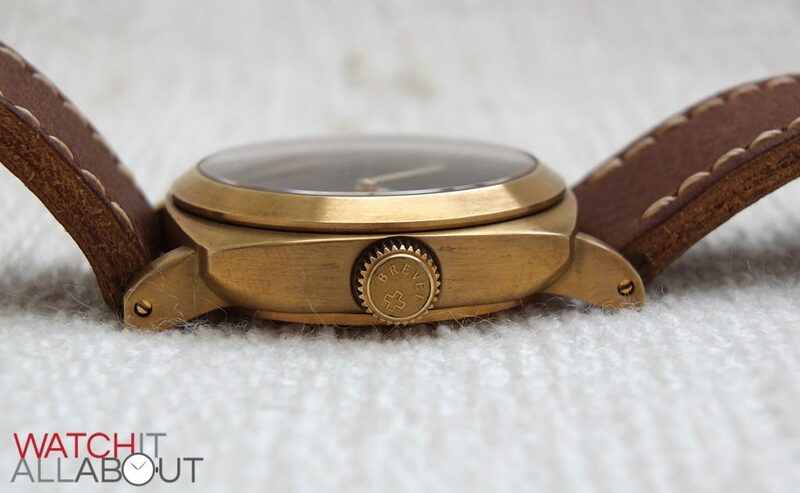 But, the stumpiness off the lugs come into play, offering a relatively short lug to lug length, resulting in the watch sitting on the wrist with no major difficulty (I have a 7.5” wrist). They are also well angled down, hugging the wrist in a comfortable way. 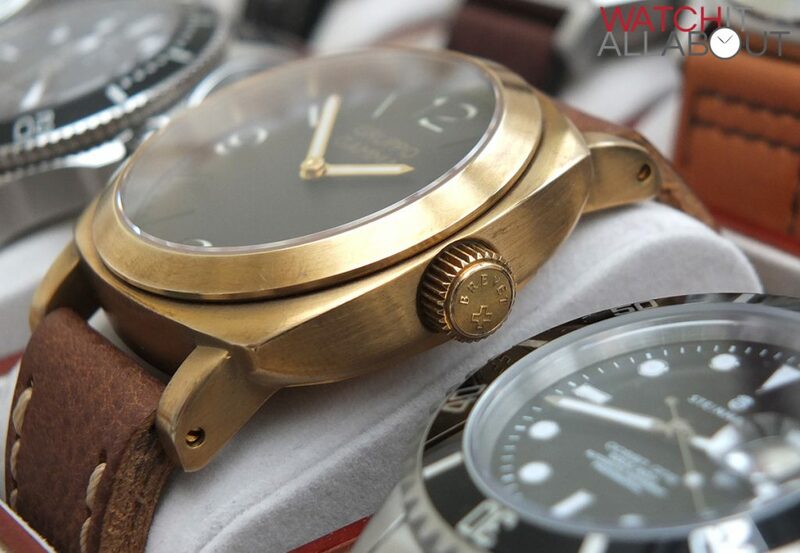 The lug width is 24mm, so the usual width for a Panerai style watch. 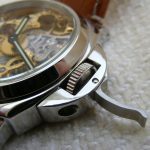 It’s also worth noting that the lugs are drilled through, and pins are screw-in, so changing the strap will be a doddle with minimum risk of damaging the case with your strap pin tool. 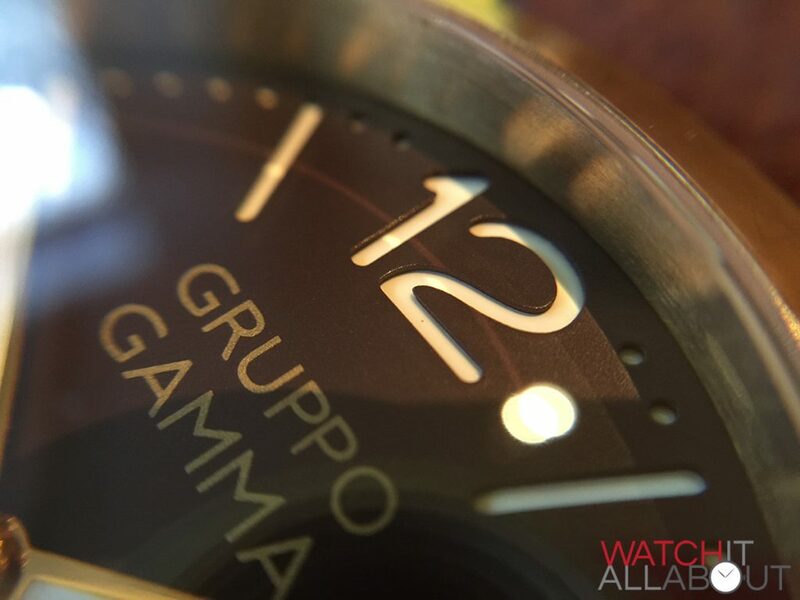 The Gruppo Gamma A-41 weighs in at 120g. 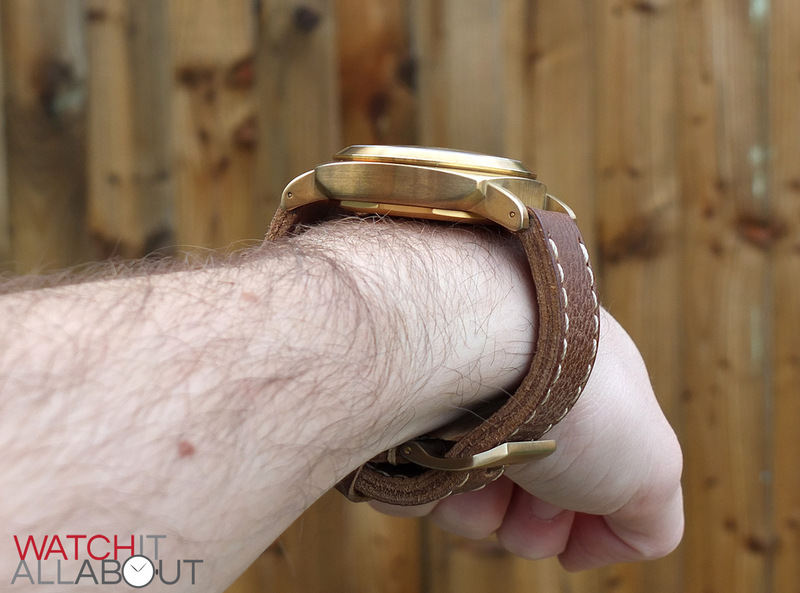 This is a good weight, and when you wear the watch you certainly know you’ve got it on. This is mainly due to the fact that brass is denser than stainless steel, so therefore it’s heavier too. The water resistance is 100m / 10ATM, thanks to the screw-in crown and caseback. This makes it suitable for recreational swimming and snorkelling, but not good enough for diving. 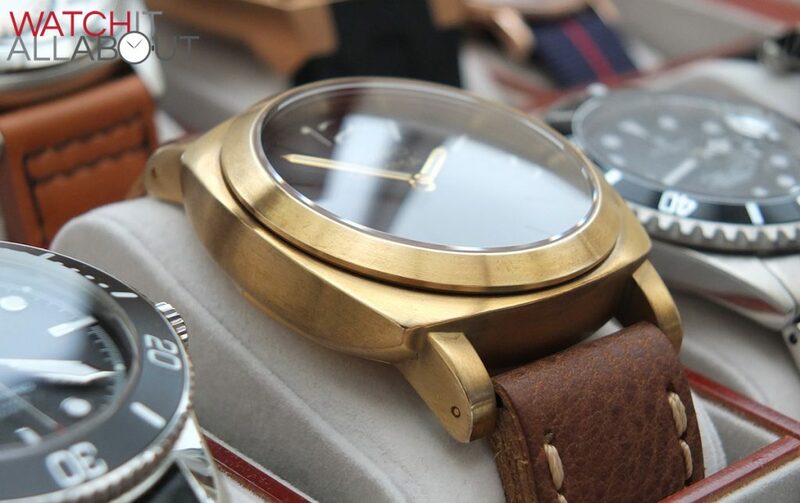 And the sea water will make the brass case look pretty amazing too, so get out there and go for a dunk. The crystal is a double domed sapphire crystal – again, a pleasant surprise for a watch costing this much. Double domed means that there is not only a domed top, but also a domed bottom too. Usually with a standard domed (top only, with a flat bottom) crystal you get terrible issues with visibility at sharp angles – you end up seeing lines across the crystal. 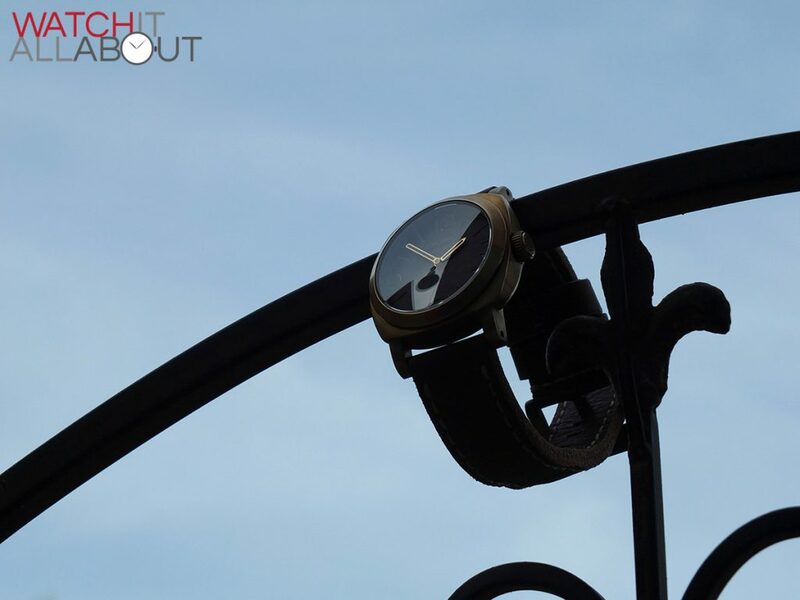 But with a double domed crystal, the dome on the underside counteracts the top dome, which means that you can see the dial perfectly, with no distortion no matter which angle you look at. You can tell it’s a well made and high quality sapphire crystal as the clarity is excellent, and the two domes work in sync together perfectly. The crystal has an anti-reflective (AR) coating on the underside. I’ll be honest though, it doesn’t seem to do a particularly effective job. You still get a lot of reflections at all angles – it’s been a bit of a pain to take decent pictures of the A-41 because of this. 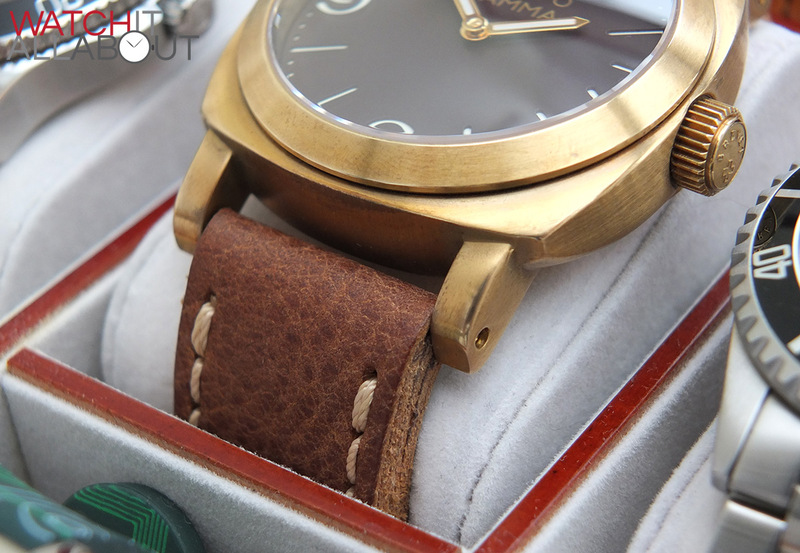 The crown is also made of brass, to match the case. 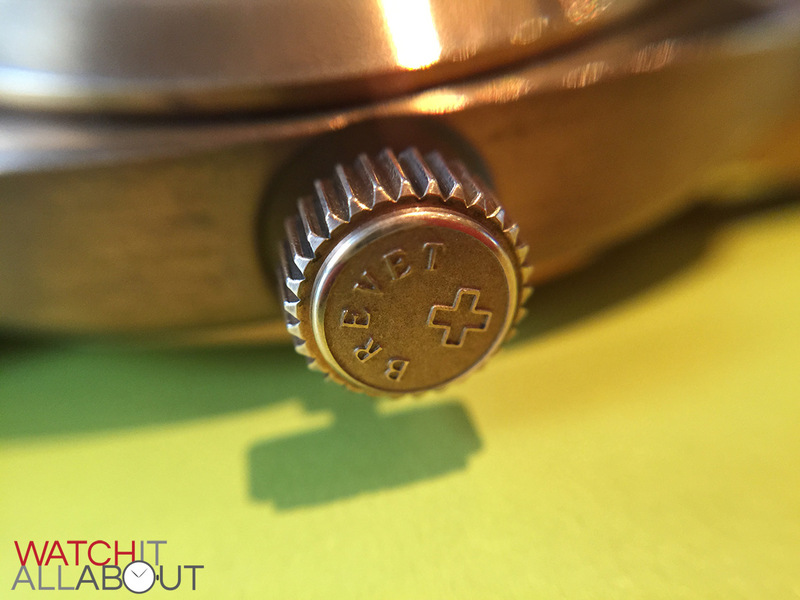 It’s a bit of an homage to the first screw-in crown, as it has “Brevet” engraved into it, which is French for patented, and also has the cross from the Swiss flag, being an ode to a Swiss Made watch. These engravings are very good and precise, even though they’re rather small and delicate. The teeth of the grip are quite sharp, so when you unscrew the crown to set the watch, it’s a little rough on the fingers. The crowns thread on the case is steel, rather than brass – this is a vital feature as if the thread was brass, the oxidisation of the thread and the crown would result in them fusing together. So this is a very important but thoughtful touch. 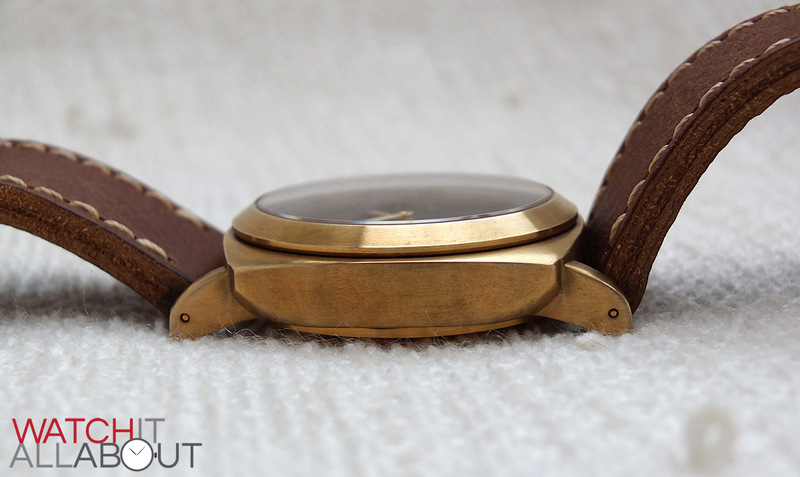 The screw-in caseback is not brass – but rather it is IPG (ion plating gold) coated stainless steel. 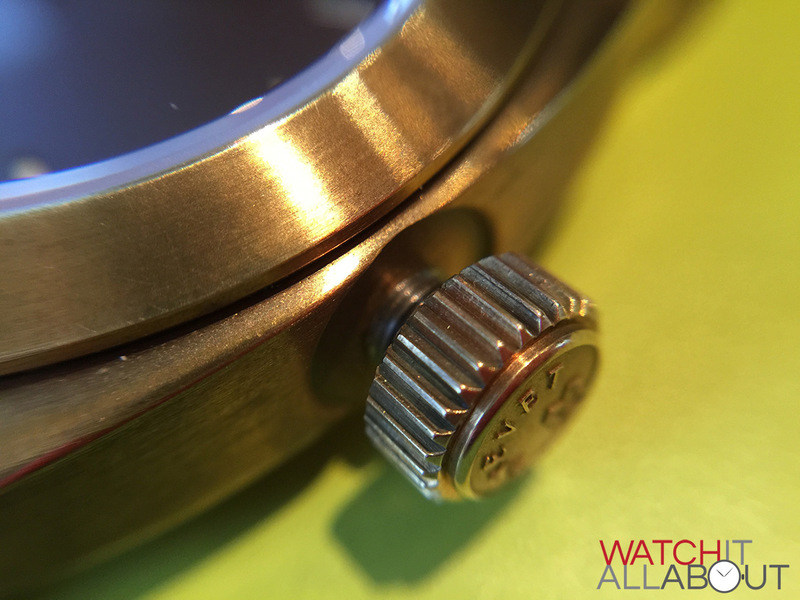 The reason behind this is the same as the crown’s thread – it’s not brass so it won’t seal shut onto the case. The case back has an exhibition window displaying the full size of the movement, and also has some watch specifics quite deeply engraved around the mineral crystal. 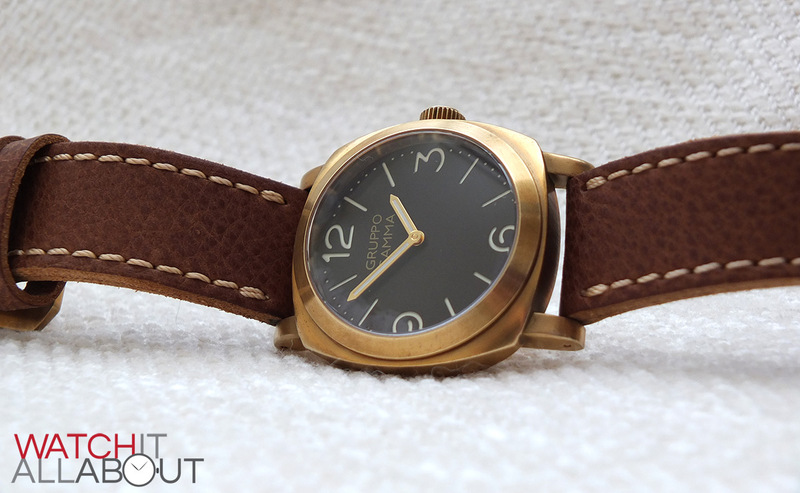 Finally, there’s the patina that comes along with owning and wearing a brass watch. The pictures in this review is after about 2 weeks of solid wear. You can see it just starting to develop. The patina is the outside layer of the metal reacting to the oxygen in the air, and is why brass objects end up going green. 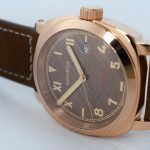 But don’t be scared, you won’t end up with a green watch in a year or two – you can remove the patina with a standard cape cod cloth. The case is fully brushed, which makes most sense. 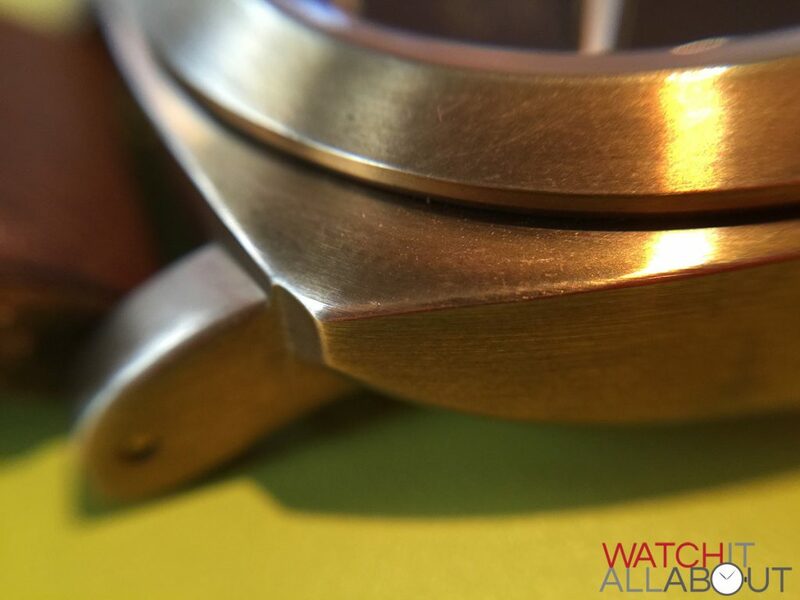 Once the patina inevitably develops, it would not look as great on a fully polished watch. The brushed finish matches the epic tool-like diver ethos of the watch. 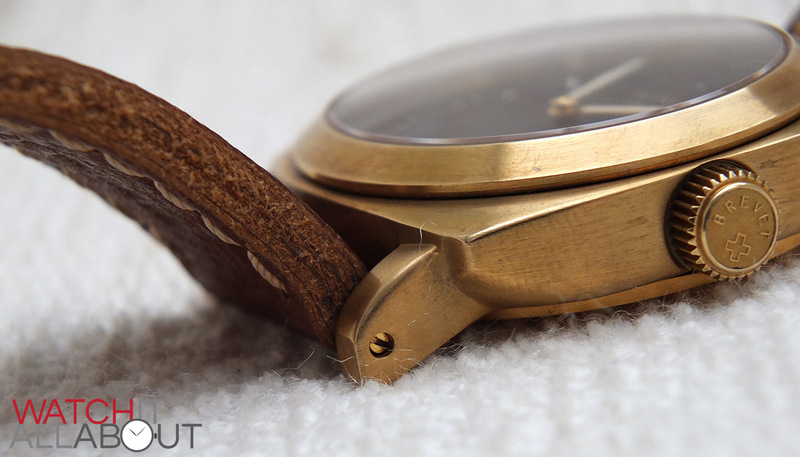 The cool thing about the fact that it’s a brushed brass case is that it doesn’t matter if you slightly scratch or ding the watch. In fact, it’ll just add character. The patina will envelop any imperfections, and will look great whilst doing it. You certainly can’t say that for a standard steel case. It’s actually quite liberating. 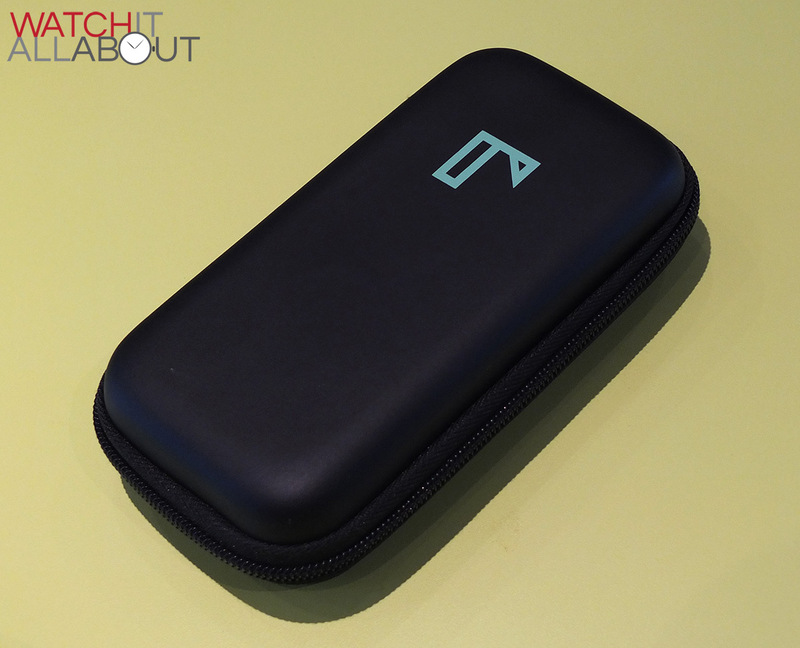 The case as a whole is very well machined and finished – which is no real surprise here. 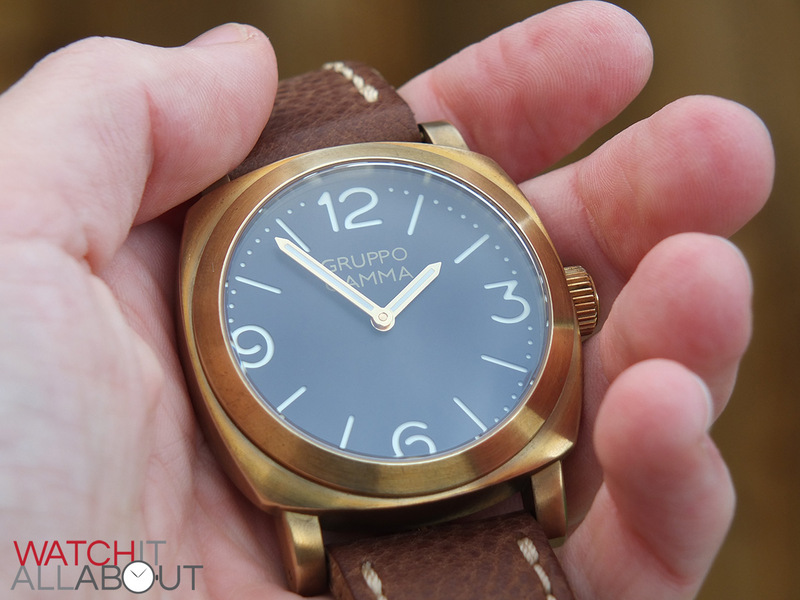 Gruppo Gamma have done a great job in creating a solid watch for a reasonable price. 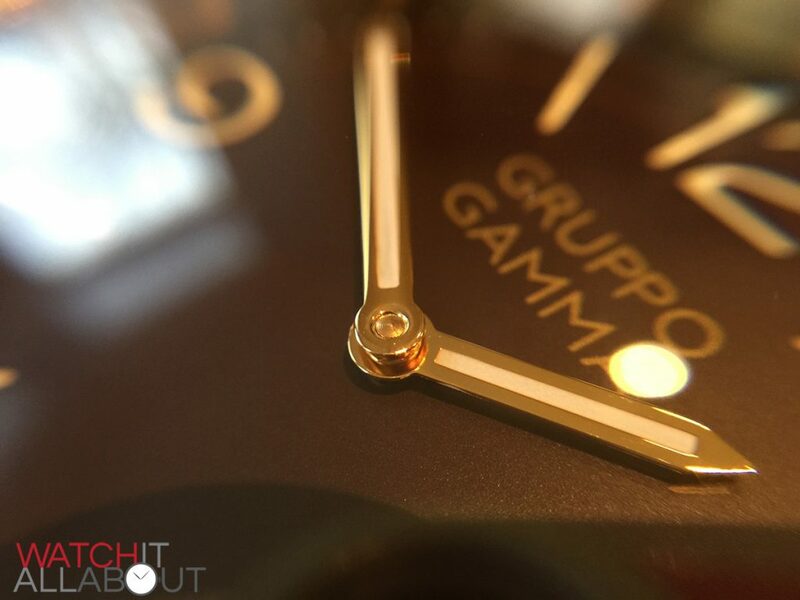 The dial on the Gruppo Gamma is very simple, and is a classic Panerai style due to it being a sandwich dial, and thanks to the design of the numerals at 12, 3, 6 and 9. The sandwich dial elements are all on a lower, lumed level. A sandwich dial is where the top layer of the dial has the markings chased out of it, so the lower level, which is lumed, provides the colour and fill. In this case, it is the numerals and also the dotted minute track which is cut out. 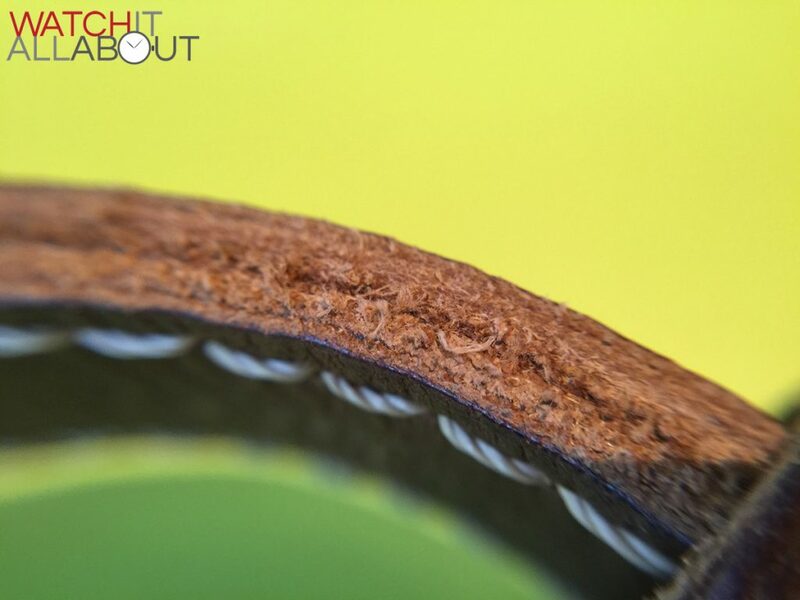 All the cutting out is extremely accurate and impressively exact, even under a macro lens. This precision is nice to see on a watch that only costs $300. 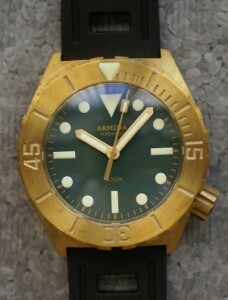 The dial comes in three variants: green, brown and blue. 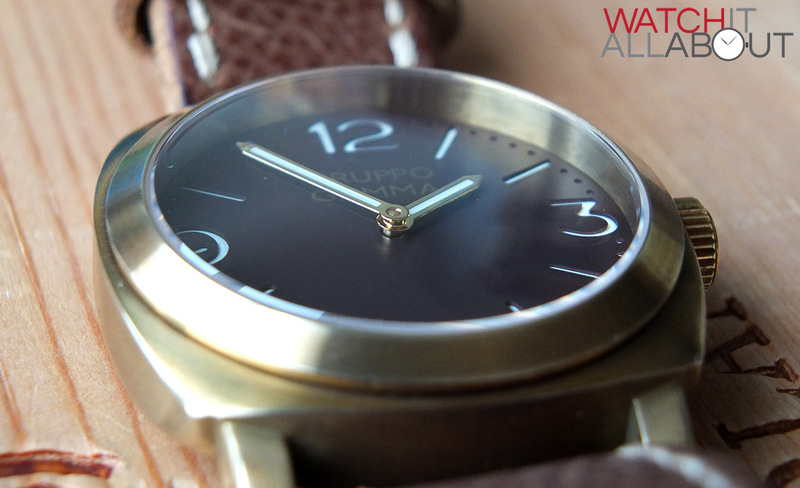 The watch I’m reviewing is a deep brown colour, which I feel is the nicest and most suitable colour out of the three. 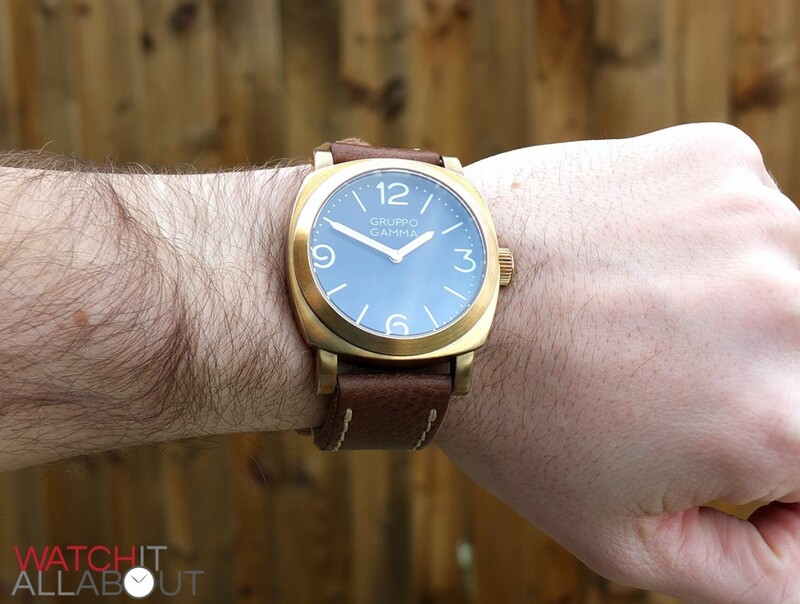 It really matches the leather strap and brass case. The hands are very simple, being a straight baton with a small point at the end. They are gold plated, with a polished finish. Again, this colour matches the whole design of the watch well, albeit slightly blingy in my eyes. The lumed centre of the hands match the lume of the numerals on the dial well – both are evenly applied and the same colour. And once more, the hands are made flawlessly, without any tool marks or imperfections visible. 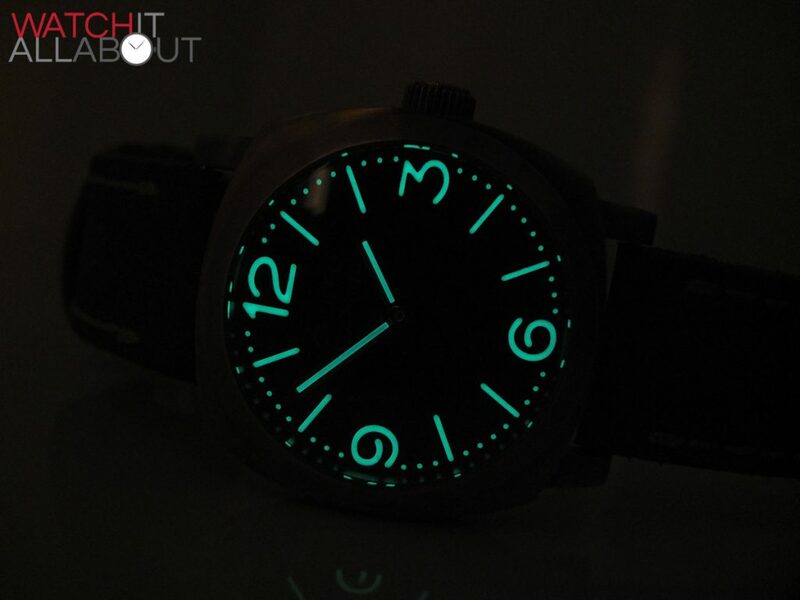 The lume is impressive strength too, charging well and quickly. 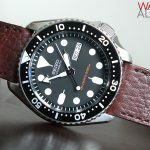 It lasts a good amount of time, and is proving to be as bright and long lasting than any of my other affordable watches, such as the Christopher Ward C60 and the Steinhart Ocean 1. 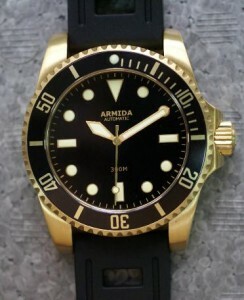 The printing on the dial is very minimal, with “Gruppo Gamma” in the top half being the only marking. This is printed in a fine font weight, and is a pleasant gold colour – matching the hands and case well. 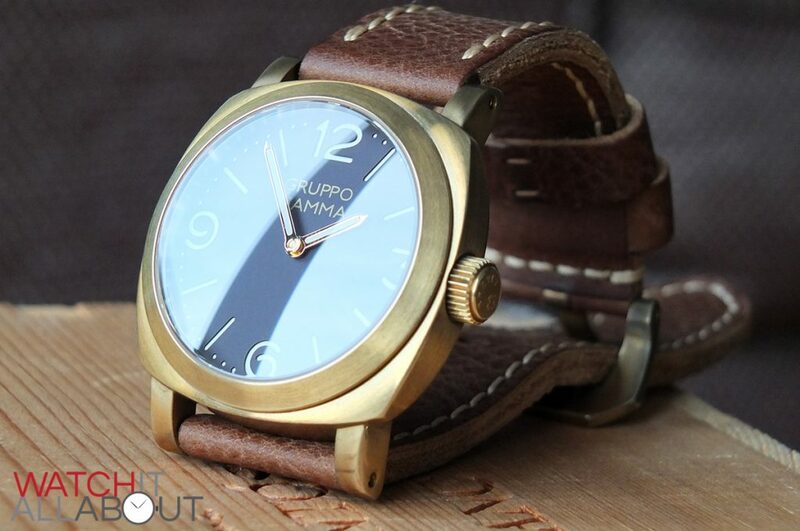 The dial overall is plain and simple, with classic Panerai styling provided by the numeral font and sandwich dial. It’s all perfectly and impressively executed for the price. 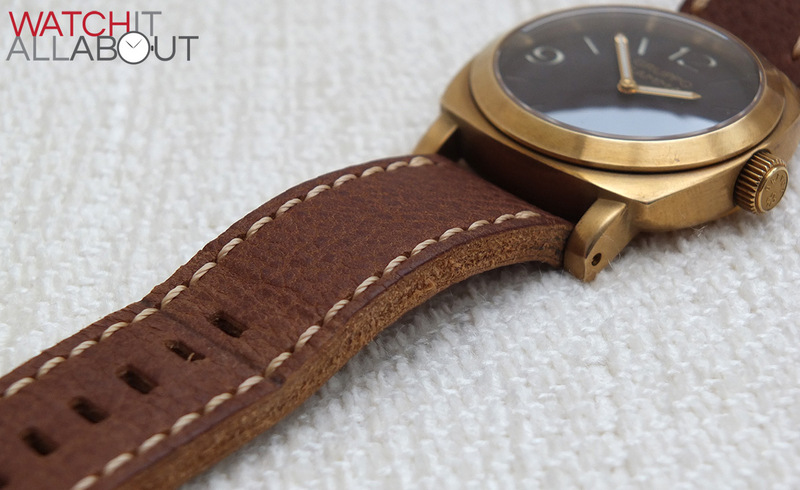 The strap is 24mm wide the whole length, which is extremely wide and provides a real statement whilst wearing the watch. 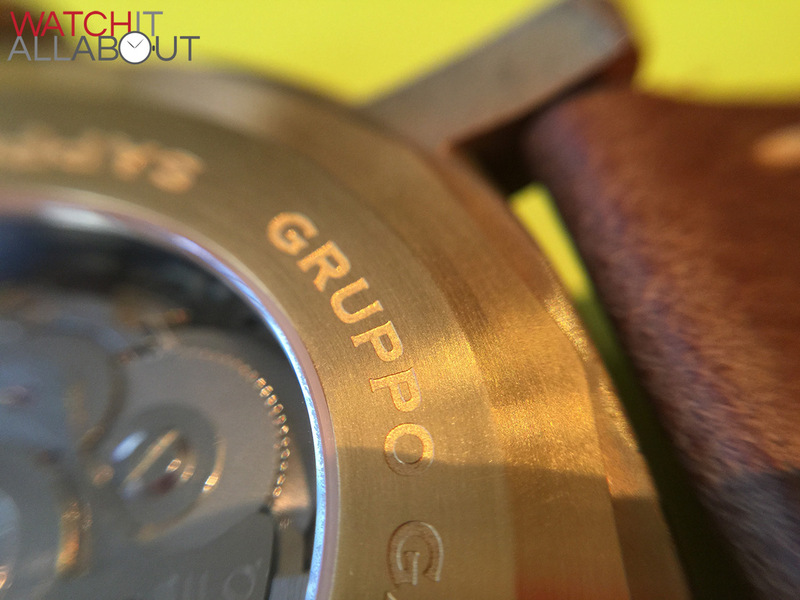 It’s quite surprising how much a strap and effects the overall appearance of a watch, and in the case of the Gruppo Gamma A-41, the strap works in favour of it. 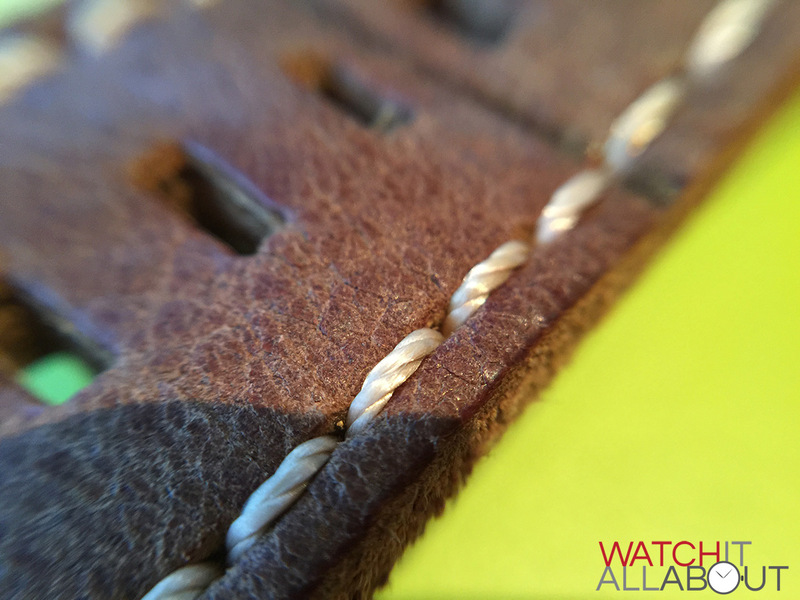 The strap is also nice and thick (around 4-5mm), and thanks to the raw open edges you can see the layers. 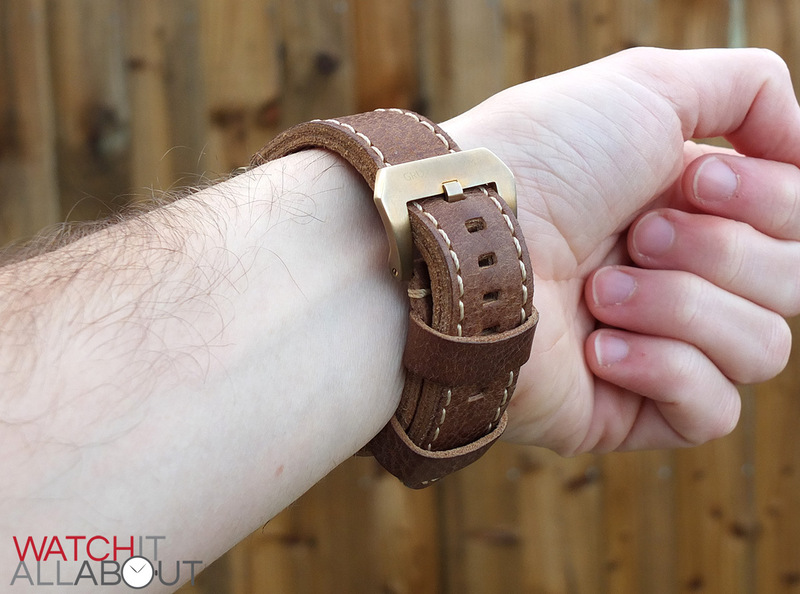 This makes the strap very soft and almost squishy, which is beautifully comfortable on the wrist. It does mean, however, that you get quite a dent on the front and rear of the strap where the buckle meets it whilst wearing it. I know this is inevitable, but it seems to have done it sooner than I would have liked. The colour is a very pleasant light brown, with a lot of character in its grain. 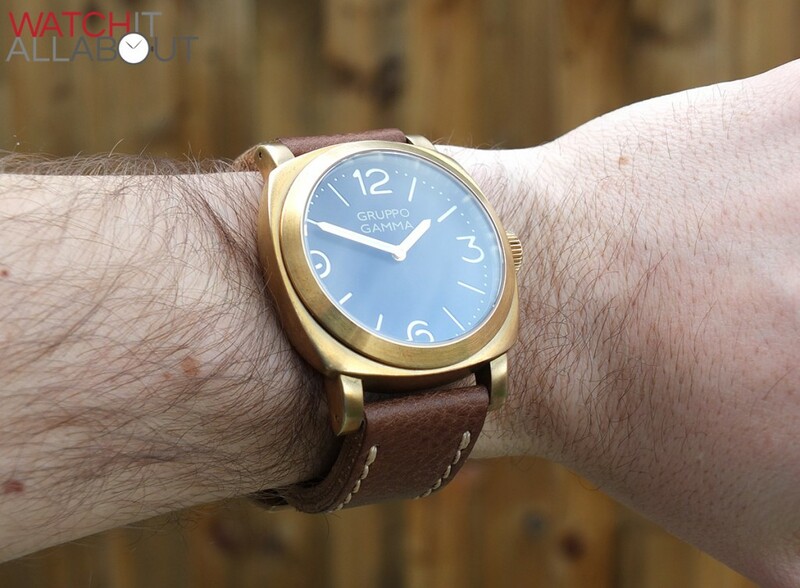 This matches the dial perfectly, as well as the brass case and provides a very well-rounded and synchronised colour scheme. 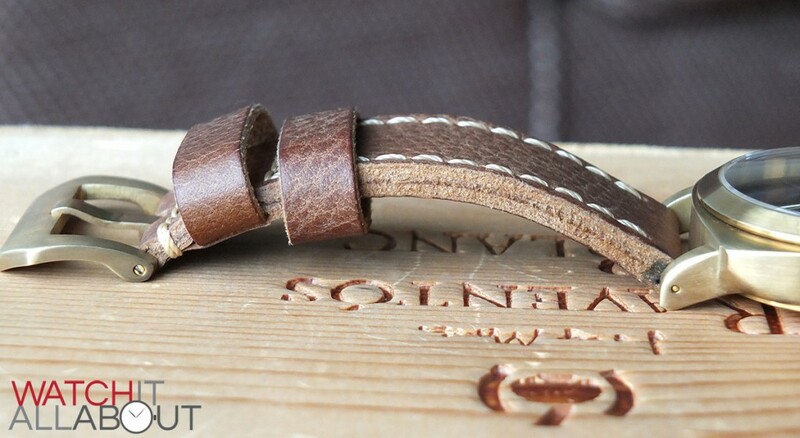 The cream stitching also enhances the design too, providing a lighter streak around the edge of the strap. All the stitching is impressively done, with a high quality and thick weighted stitch. The buckle is a classic pre-v (pre-vendrome) design, and is also made of brass. So it’ll develop a lovely patina at the same rate as the case and will match perfectly. It is very well made as you’d expect, and has “Gruppo Gamma” etched on the top. I would have liked it to be engraved a little deeper, but I’m a sucker for that kind of thing. 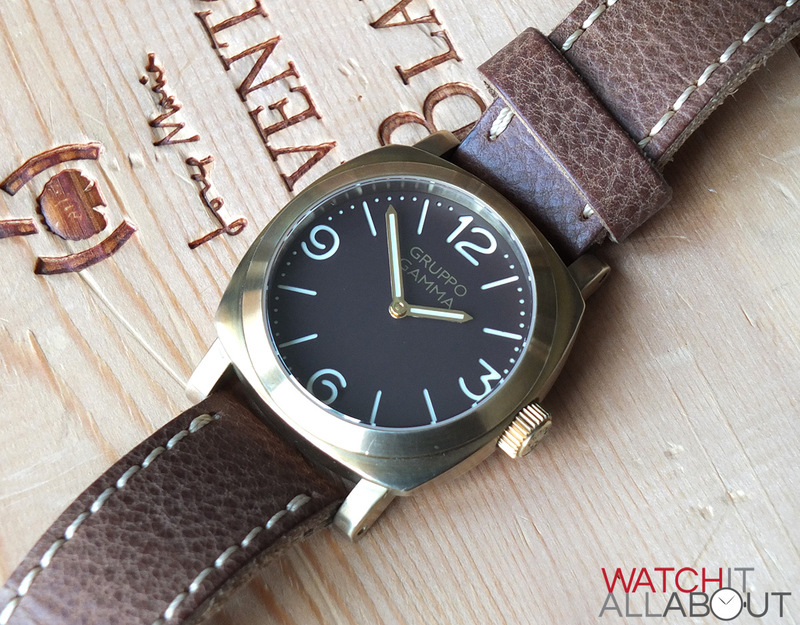 Powering the Gruppo Gamma A-41 is a Seiko NH35A. This is an upgrade to their standard automatic movements found in the Seiko 5s and the like, thanks to the added features of hand winding and a hacking seconds hand. 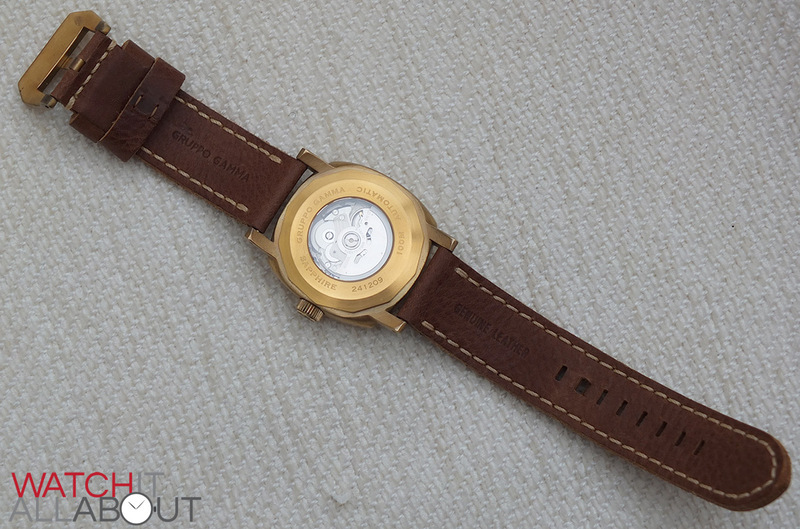 It’s becoming well known to be an excellent quality movement for a low price, and one that will last a long time. It has 24 jewels, runs at 21.6k bph (6 ticks per second), and has a 41 hour power reserve. Because the watch doesn’t have a seconds hand, it doesn’t really matter that it’s a low beat movement. It also means that you can’t set the watch with perfect accuracy as you’ll never know where the second hand is. So the hacking second hand in this instance is a wasted feature. 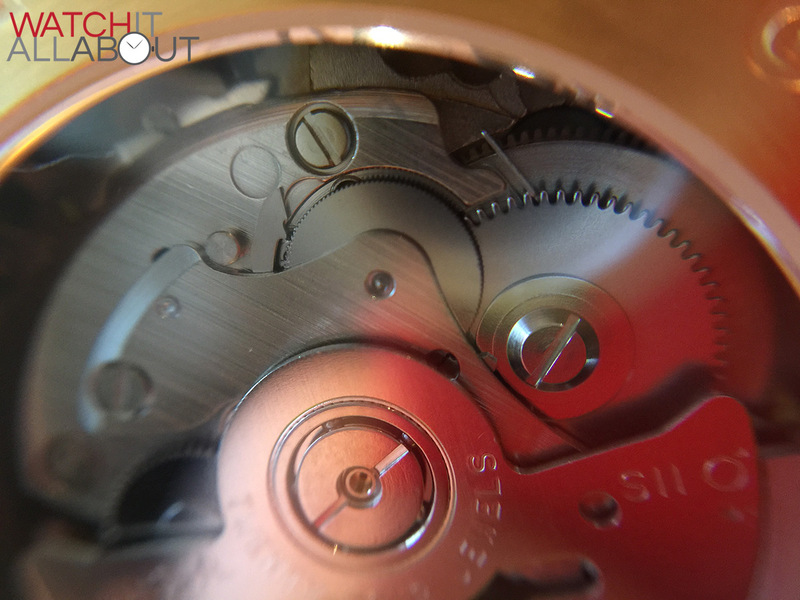 It’s an automatic movement, and the rotor winds the mainspring up in both directions – clockwise and anti-clockwise. 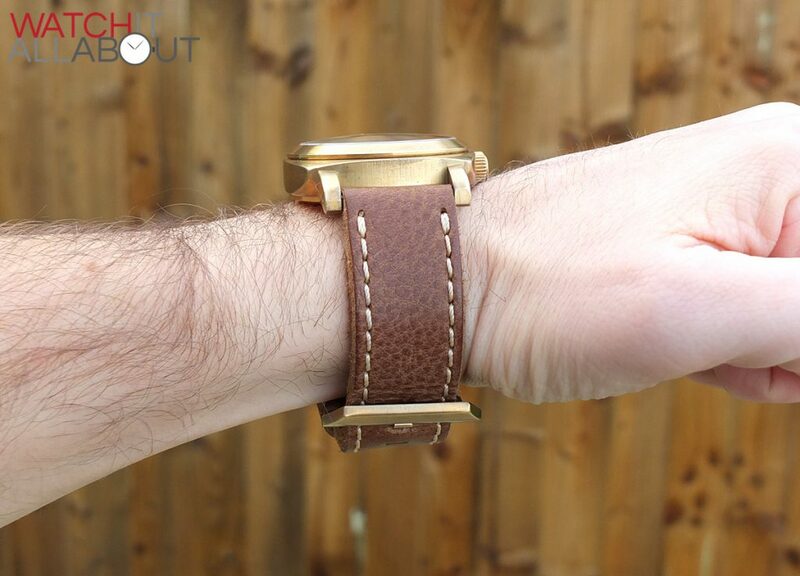 This allows the movement to be wound up quickly whilst wearing the watch. 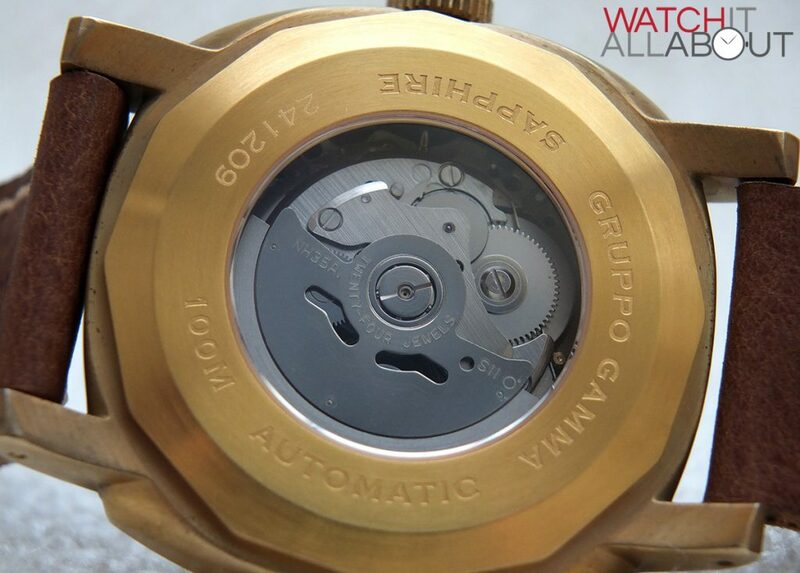 Accuracy wise, the NH35A is renowned for being very good, and the movement in the Gruppo Gamma A-41 has not disappointed. It’s gained only 1 minute in a week, which equals to less than 10 seconds fast a day. Not bad at all really. The NH31A isn’t too bad in the looks department either, albeit a bit plain. It doesn’t have any sort of guilloche pattern but it does have an industrial brushed finish and appears to be well built from a visual standpoint. Obviously the Maranez Layan is exactly the same price as the Gruppo Gamma, but I think that the design is inferior. I can’t really pass any other comment on these other watches, but for the price you’ll still get a nice watch for the money. 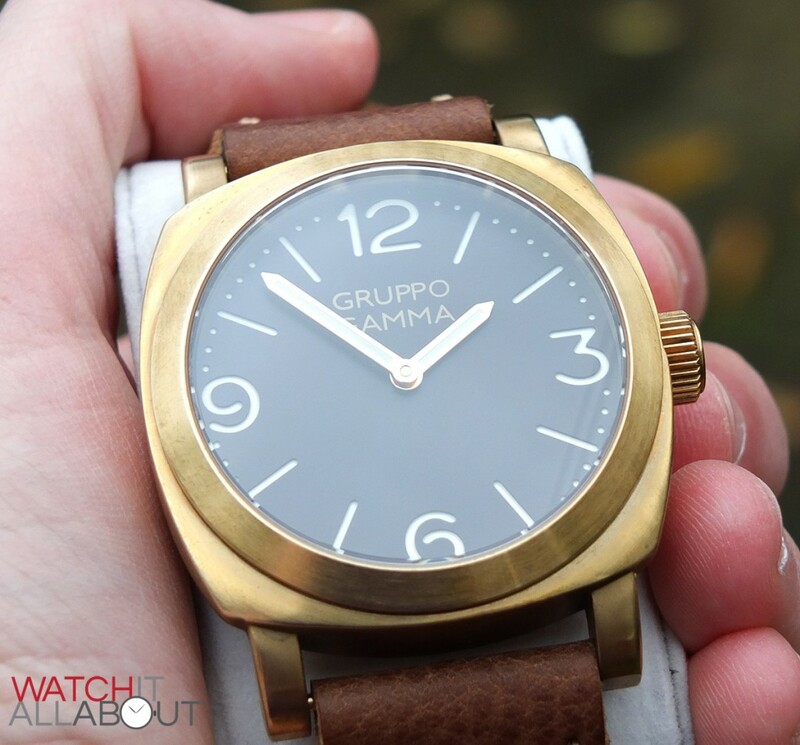 Do I like the Gruppo Gamma A-41? I certainly do. In fact, I like it that much I’d happily have it as my everyday watch. And any watch enthusiast will know what a big deal that is. It’s well made, comfortable, well designed, and at a price that can’t be sniffed at (£190). 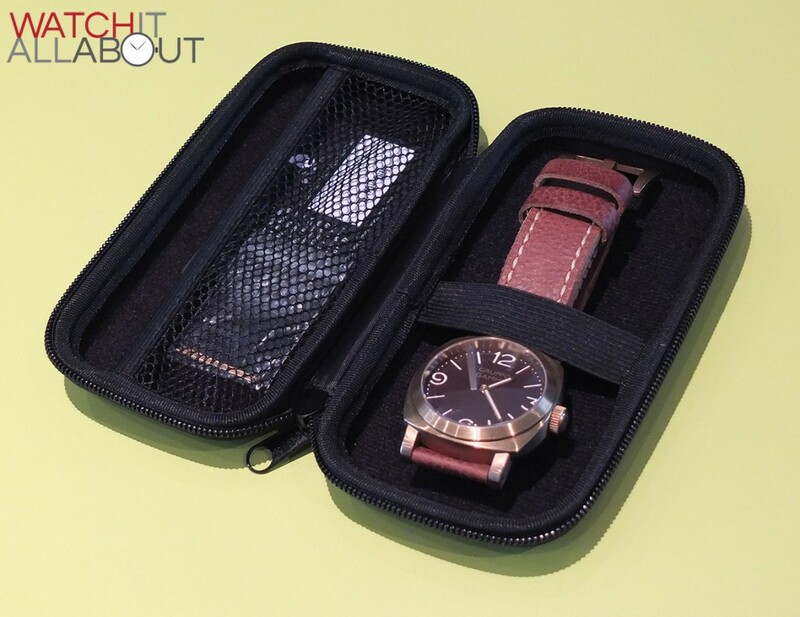 I also really like the travel case the watch comes in, it has already proved to be extremely useful – much better than another watch box that ends up in the attic. Some will complain about the similarities it has to Panerai, but to be honest the similarities aren’t enough for me to label the Gruppo Gammas as replicas or an all-out homage. The brass case will develop with me as I wear it more, and as such, we’ll develop a strong enough bond as its character increases with the patina. I’m pretty sure this will turn into a long term favourite of mine. Thanks for another great review, Joshua – I’ve recently been fortunate enough to be able to purchase a G-12 “Vanguard” from Gruppo Gamma and I’m now desperately waiting for my A-41. 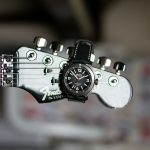 I completely agree with what you wrote about the quality of the GG case, dial, crystal, strap etc. 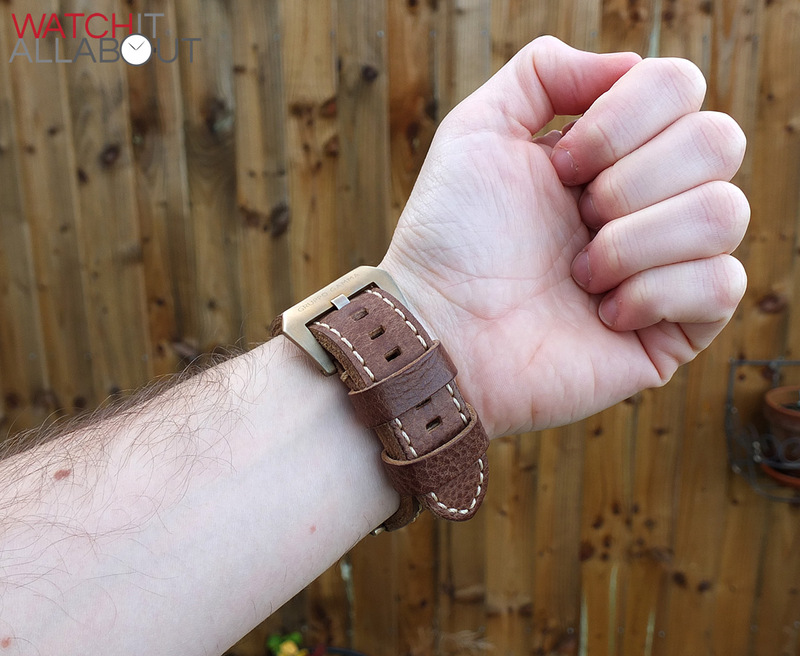 – it’s all perfectly machined and wears really comfortably even on my tiny 7″ wrist. My only minor complaints are that the rotor is a tad noisy and the crystal isn’t perfectly set on my G-12. 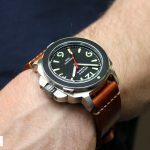 Overall GG does great watches at a reasonable price – with shipping, tax and customs it’s slightly less of a steal, though. Altogether I paid ~€375 – which also get’s me a Steinhart O1 w/ a Swiss movement (but not extra super-soft leather strap, screw driver and great travel case). The clean, almost minimalist, styling of this watch is genuinely appealing to me and it’s great to read the quality is there as well. Unfortunately, this now means I’m facing a dilemma: do I add another Magrette (well worth checking out by the way at around $500) to my collection or do I go with GG. To be honest, I probably wouldn’t go with the brass case but I do like the Vanguard, and the Titanium Vanguard, and the Genesis. Wish me luck! So in February I faced a dilemma and in April I set alerts and waited, and waited. 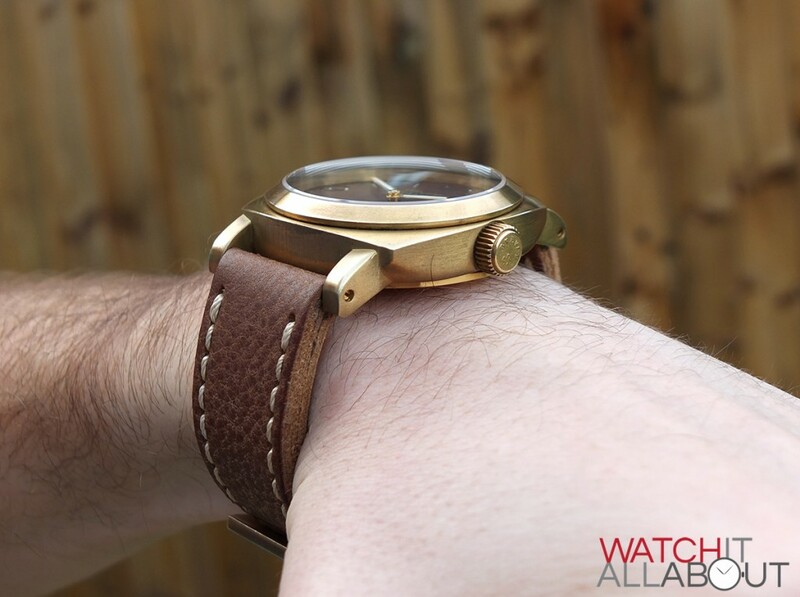 The Genesis was retired from production (a friend bought one of the very last in mid May) and I was uncertain about the 47mm Titanium watch with its 57mm lug-to-lug span (still am). 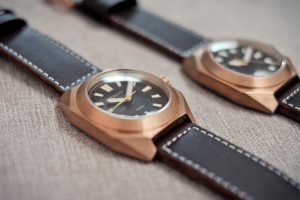 I set alerts on the 44mm Vanguard steel and PVD versions. In June, my patience paid off. I received an email saying the G12-D (PVD) was available for purchase. 5 days later (Wednesday this week) it arrived in North Yorkshire. Needless to say, I’m thoroughly delighted with it and I suspect it’ll be my daily wearer for a few weeks. 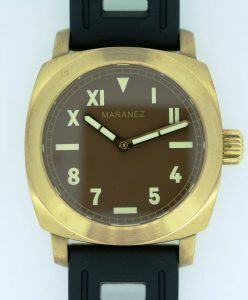 Many thanks for introducing me to a great watchmaking company and a great watch.